Two story manufactured homes are not as commonplace as bungalow or ground floor manufactured homes in Nigeria. That should not surprise you because the most popular residential house type in Nigeria are bungalow houses. Similarly, the most popular manufactured homes in Nigeria are bungalow homes. Why are bungalow homes the preferred prefab house type in Nigeria? Simple reason . . . cost of acquisition. It's cheaper to buy a prefab bungalow than to buy a two story manufactured home. 2 story manufactured homes (and 2 story modular homes) consume more building materials than Nigeria bungalow houses, which are essentially ground floor (or single floor) houses. Yes, 2 floor and 3 floor houses will naturally cost more than single floor houses! 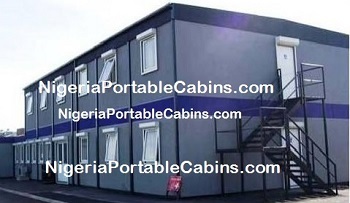 Can two story manufactured homes be constructed by Nigeria engineers? We build custom designed modular and manufactured homes . . . single floor and multi-floor prefabricated homes. If you want to build a single or multi-floor prefab house . . . one story prefab houses, 2 story modular homes, or prefab duplex . . . simply request a quote and we will send you cost effective quote and build to your design. There are two options available to you when thinking of building multi-floor prefab houses. Let's take an example to illustrate the options. Suppose you want to build a 2 story manufactured home. You can either order a . . . When you order 2 story manufactured homes, you're ordering a permanent structure. In this case, a block and cement foundation (finished with concrete top) will first be constructed. And thereafter, the steel building will be constructed above the concrete foundation. This type of construction is suitable for prefab duplex construction, prefab warehouse building, prefab factory construction, prefab school building, and any other prefab house that is designed to be permanent. In building this type of manufactured homes with block and concrete foundation, all building materials are transported to the site and construction work takes place right at the premises where the building is required. Option 2 is somewhat different. That is, building the two story house as a two story modular home. In this particular case, the manufactured home (or prefab house) is built in modules and the modules are then assembled on site into a single building (see picture on this page). In the case of the modular house, a large part of the construction work is done in our factory and only construction work related to assembly of the modules takes place at the customer's site. Consequently, the construction team spends less time at the customer's site when the building is broken into modules and the modules are manufactured in our factory before being transported to the customer's site for assembly. What's the impact on overall cost? Building big modules and transporting them to the customer's site for assembly tend to cost more when you evaluate the total cost of building the 2 story manufactured home. reduces the number of days spent by the construction team at the customer's site and, hence, the overall onsite building construction cost. 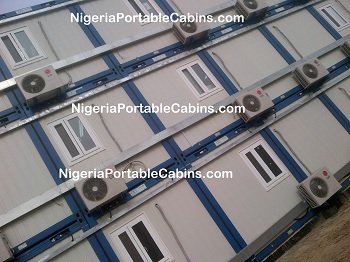 Thinking of building 2 story manufactured homes or 2 story modular homes anywhere in Nigeria? Whether you want a 1 story house, 2 story house, or a single floor bungalow house, we're here to build to your specifications.